Corrosion is easy to clean up with a battery brush and a wrench that fits your battery clamps. Remember to disconnect your battery before applying any cleaning agents and follow the proper safety precautions. If you don’t feel comfortable cleaning it yourself, talk to your mechanic the next time you take your car in for service. 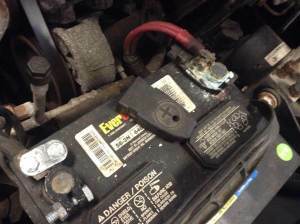 As we mentioned earlier, corrosion cannot make your battery catch fire, but it can keep your car from starting. If the corrosion extends into the battery post connection, it’s possible that your car may not start at some crucial moment. You should be checking your engine periodically anyway so, when you do, take a look at your battery and check for build up around the battery terminals. If you do this regularly, you should be able to just wipe it away with a cloth or paper towel instead of performing a deep clean. If you notice excessive buildup between cleans, you should call your mechanic. If you suspect that your battery may have terminal corrosion, have the vehicle inspected by a professional technician at V&F. All of our auto repair services are backed by an industry-leading 3 year / 36,000 mile warranty on parts and labor. Call us today at (413) 314-2280 or schedule an appointment online.